Got a small space? 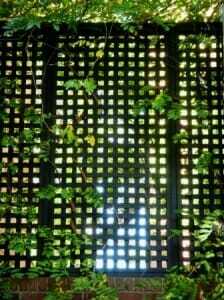 To help you decide what kind of structure to use for your vertical garden, consider these 15 practical design tips. 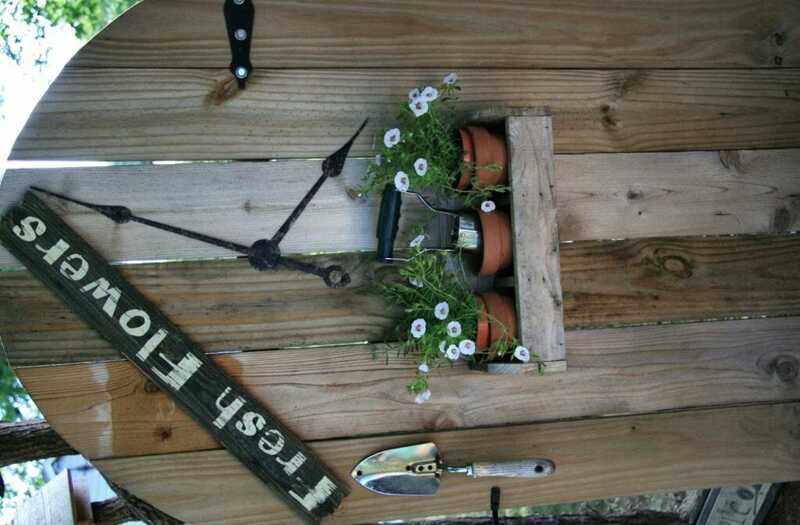 This garden gate has been used not only for functional vertical growing space with a mounted planter box filled with flower pots but also a handy place to hang some garden art. A gateway is usually the point of entry and the place where you make first impressions! 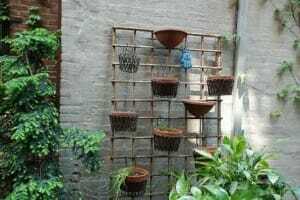 With a little imagination this space can be another creative vertical garden. An attractive gate or arbor adds character, welcomes visitors and can share a little of your personality too. The entrance to this micro front garden is framed by an arbor of fragrant cascading jasmine which acts as a perfumed privacy wall too. This clever unattached vertical trellis and planter garden is a portable solution for people on the move or those with limited sun. A lightweight frame with hanging hooks can be adapted to many situations. Depending on where you position your plants, as they grow upwards they may block sunlight from reaching plants behind or below them. Place vertical structures such as tepees and arbors where you need to shade understorey plants otherwise if they don’t get enough sun, they may suffer. 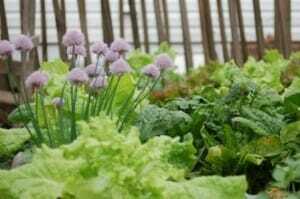 Some plants love shade or can tolerate semi-shade so take advantage of these spaces by planting vegetables like spinach or lettuce especially in the warmer months. 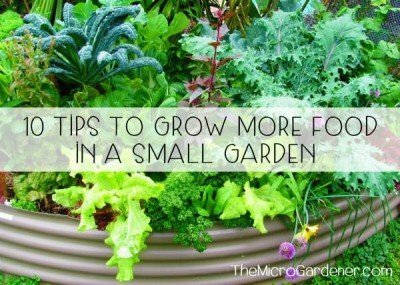 Grow shade tolerant edibles like lettuce, chives and spinach if you are cramped for space where you are growing your vertical garden. 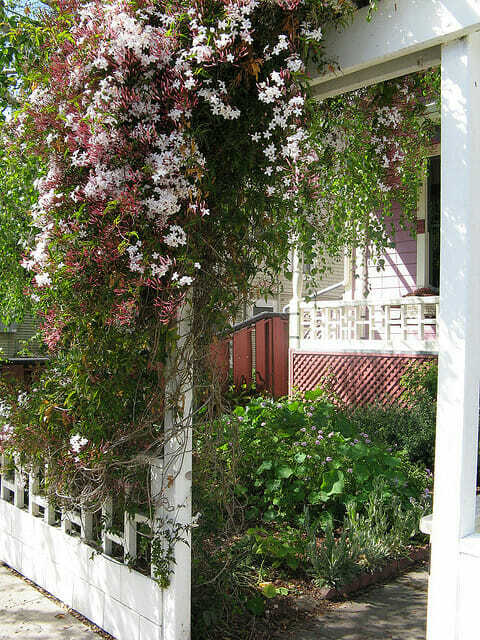 If you are growing a vine or creeper up a trellis to create more shade or privacy, consider what kind of plant you grow and whether you will need access for pruning as it matures. 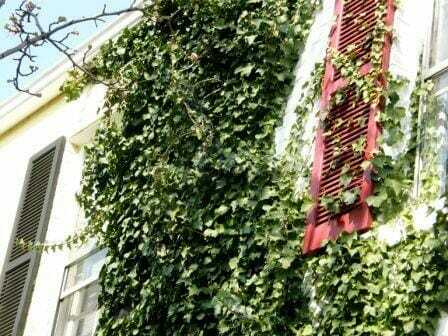 If so, how easy is it to reach the top of the trellis or structure if you need to give your living wall a haircut? Read the plant label so you choose a species that will grow to a suitable height and provide you with the screen you need without creating future work for you. 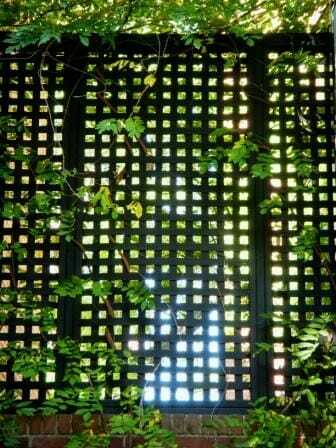 This decorative vertical lattice screen provides both shade and privacy. Consider how vigorous the plant you grow will be and how long it will take to achieve the effect you want. Avoid wasting walls and fences that provide you with blank canvases for growing or displaying garden art. 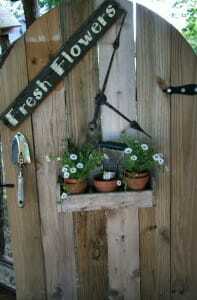 If you can’t drill into the front of a fence or gate, try hanging hooks with planters over the top. Likewise, artwork and signs can be attached with a little creative inspiration. 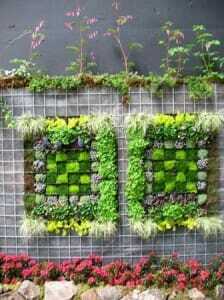 This stunning vertical garden makes maximum use of wall space and is in itself garden art. Don’t knock yourself out! 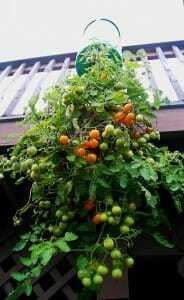 Position hanging baskets or upside down planters where you won’t knock your head as you walk past and check there is adequate support for their weight. Avoid hanging them too high or they will be difficult to water and maintain. If you don’t have any other option, invest in a pulley system so you can lower and raise your planter. 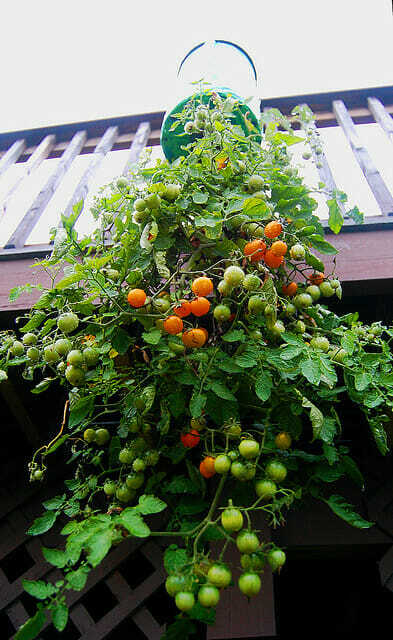 When soil is wet and plants are fully mature like this topsy-turvy fruiting tomato planter, they can be really heavy. Make sure you can easily reach the plant to harvest and maintain. As these are often positioned overhead, for safety reasons make sure they are securely attached! Avoid heavyweight materials and use light plastic or wire instead, or install around the perimeter of the structure where the building has been engineered to have the greatest strength. Window boxes are usually long and narrow and as with hanging baskets, tend to only hold a small amount of soil so are best used for seasonal displays or refreshed regularly. 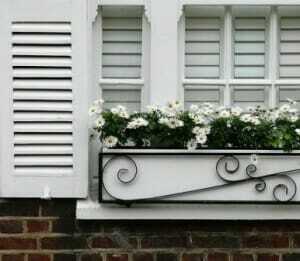 A window box can also be secured with a decorative bracket to hold it in place. Here a ‘white-on-white’ theme is a simple but attractive feature. Consider the maximum height the plant is likely to grow when it is mature. This will have an impact on what kind of structure you choose and affect accessibility for watering, fertilising, pruning and maintenance. Consider how high you can comfortably reach! 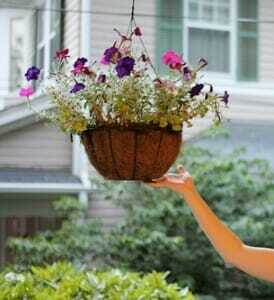 Design out work for yourself: hang pots and planters in easy reach for maintenance tasks. The mature weight of plants will also have an impact on the structure you select. The strength of the structure will need to support what you grow. No point growing heavy crops on an old rickety fence – you will only hasten its demise. Heavy vegetable crops like melons and pumpkins may need extra support by tying a mini cloth hammock underneath them until they are ready for harvesting. Be careful growing plants with adhesive pad-type tendrils as they can quickly become invasive and will stick to just about any surface. 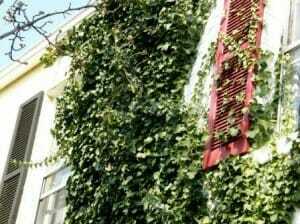 Planted too close to building walls, they can damage paintwork, timber, mortar and other exterior materials. Avoid unnecessary damage to buildings with a little careful thought to the plants you grow. 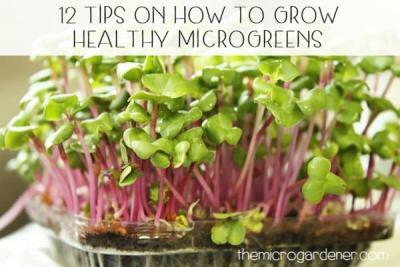 Depending on the location of your vertical garden, plants that are not planted in the ground and are exposed to more sun and wind can need a drink more often. They may be vulnerable to wider fluctuations in temperature too. Add extra mulch to compensate, water wisely and choose your plant species carefully. Make sure you erect or install your vertical support structure before planting to avoid root damage once plants have started to grow. 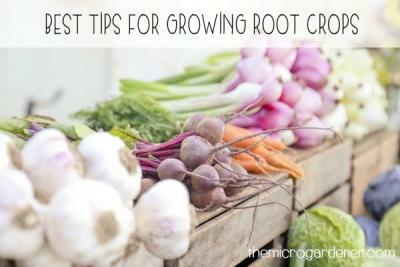 Some plants that grow out but not up on their own like indeterminate tomatoes and raspberry canes, need an extra helping hand to grow vertically. If trained to grow upwards with appropriate structures like cages, stakes and trellises with regularly spaced ties or clips, they can be extremely productive and be contained in a compact space. 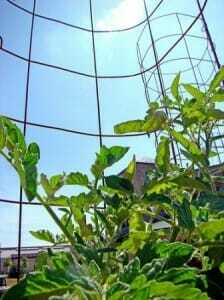 Tomato cages are a useful vertical system to contain tomatoes. You can also use soft ties as they grow to give them maximum support. Make sure you select the correct size to fit the railing width, especially if you are buying online. Ensure railings are secure and stable enough to support the weight of a railing planter. Planters will add height to the railing, so consider the total height of both the planter and plants if you don’t want to exclude your view! 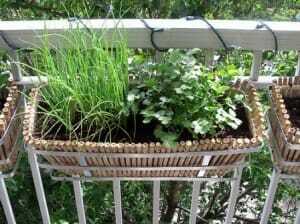 In high-wind areas or exposed high rise apartment and balcony gardens, consider anchoring lightweight vertical garden structures down. A-Frames and tepees can be secured by nailing stakes at the corners or drilling holes into the stakes and running string or wire to connect them to a stronger structure or heavy container. Check out more vertical garden solutions to grow plants in Add Space with Creative Vertical Gardens: Part 1 and Part 2 and 12 Reasons Why You Should Garden Vertically. 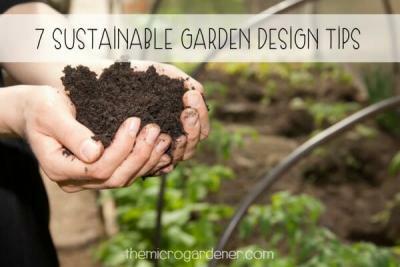 You’ll also find even more Clever Design Ideas in the Container Gardening category. Did you find this information helpful? Feel free to leave a comment below or share it. Keep up to date with new posts by subscribing to my newsletter (and grab your free eBook). Thank you so much for these tips! I am redoing our garden and I really wanted to make sure I did it right this third time around. I really like what you said about maintaining and acknowledging the gateway and entrance into your garden. It really is the first impression your garden will have on guests, so make it good! Thankyou very much for sharing the information. I am from Cochin. I am going to try this. Looking forward for more ideas. I’ll share the ones coming on my way too. Have you ever used a garden tower like this do grow outdoors? (foodygardentowers.com). I’m considering using one on the deck as a sort of vertical garden, but want to know if it’s worth the money. No I haven’t used that brand but I do have a stackable vertical garden system. I can’t comment on whether it’s worth the money but it does seem a big investment. There are many commercial options out there. If you are planning to grow edibles, I’d suggest asking for a copy of the MSDS (Material Data Safety Sheet) with plastic specifications to get more details on their claim of being BPA free. i.e. the kind of plastic the system is made from. 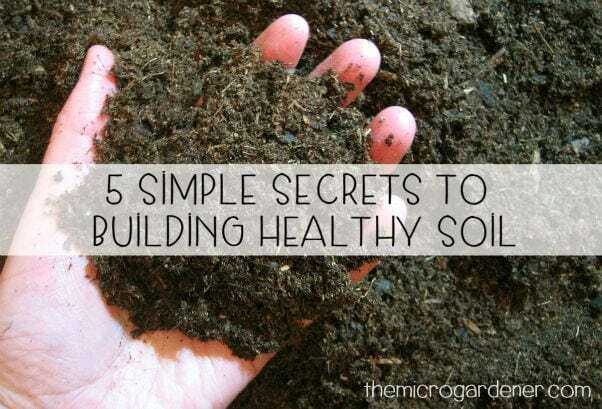 I also suggest you make your own potting mix rather than using garden soil. Best of luck with your project.